Ever take a seat on a bus, and be so tired that you conk out and miss your stop? When you wake up, you're miles from home and at the end of the route. Thanks to Google Now, that won't happen again. 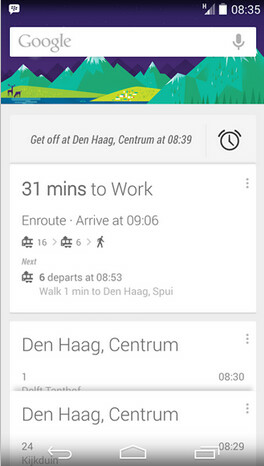 Open Google Now when you're on a train or bus, and you'll be asked if you want an alarm to go off when you are close to a previously saved location like your work or home. Tapping the screen turns the feature on, while a second tap disables it. It's another useful feature offered by Android's virtual personal assistant. The screen shot of the feature which accompanies this article, was taken in the Netherlands. Interestingly, for this feature, Google Now does not seem to tie into the alarm function of an Android phone. But what it does do is make sure that you are up and alert and ready to exit the bus or train at the right stop. Otherwise, it could be a long night as you retrace all of those extra exits you slept through. Google now is like my mum lol. Jokes aside i really like how it gives me what I want. Has anyone come across the walking card? It gives you the average time you have walked for two months. I personally love how when I searched for this year's Father's Day date, Google Now, on my desktop browser no less, asked if I wanted to be reminded when Father's Day actually comes up. Of course I said yes. That's nice! But it's approximate data. The on-screen buttons and notification bar blend in with Google Now? New thing or I didn't notice it before? Hey, he/she doesnt know. Quit bullying. In Google Now Launcher, that is possible. Meanwhile if you're using 3rd party launchers like Nova or APEX, you cant get that effect. Basic requirement is Kitkat of course. Its not like that on my Venue 7 tab. That's why I asked! No need to get all rude. The smarter the phones are, the dumber people will be. Reminding to eat? Not in Murica, baby. Oh yeah? And do you have proof that google services drain your battery inordinately? Absolutely he does, just like religious zealots have proof of God. Awe buttercup, don't worry I am sure this will get copied an put on your system of choice. Then it'll be all that to you too, I might suggest staying away from the leading OS articles, then you won't feel jelly about how much you can't do on yours. Might want to hook up with a spell check on yours in the mean time though, either that or stay in school. Like how did it not cap the the first word is beyond me, or extra space the period, lol. This is great news! I always fall asleep on the metro. Hopefully this update will com out soon. Like everybody said, Google is awesome. If it wasn't for Google, this would be called iPhone arena.